We started Unit 4.0 in the Big History Project this week which means we’ve reached Threshold level 4, the formation of our solar system and planets. 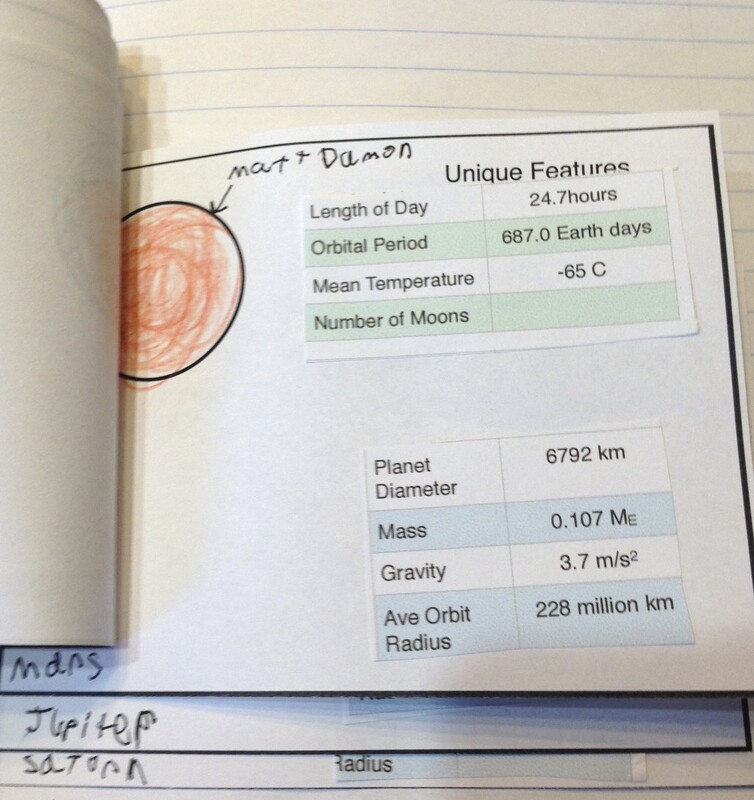 I had the kids tape in the Threshold 4 card into their notebooks as they arrived and then we watched Crash Course Astronomy video on Exoplanets because I wanted to make sure they realized that our solar system is not the only one with planets. After the video we discussed how our solar system formed and I asked them what they knew about each planet. 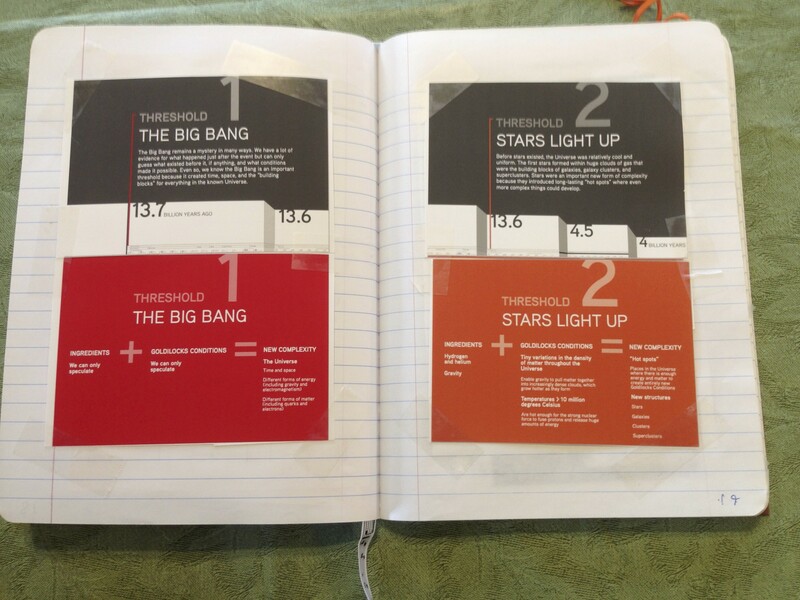 Then they did the Big History Project lesso n 4.0, Planet Card Sort, and cut out the pictures of the solar system in various stages of development and tape them into their book in the proper order. The last activity, making a flip organizer for the planets, took the longest and some kids didn’t quite finish. I got this idea from the Earth’s Place in the Universe Interactive Organizer, but I was disappointed to see they gave the planet data in miles, and the acceleration due to gravity in ft/s^2! There was no way I was handing those out, so I redid the activity in metric and changed a few of the facts, gave the mass of the planet in Earth masses so they could tell how much more or less massive the planet was compared to Earth. I also gave them blank cards with just a circle on them so they could color it in to look like one of the planets, put the name of the planet on it and then they had a sheet of planet facts they had to sort through and put the right facts on each card. I had the facts clumped together so one table had orbit radius on it, so they could actually just put those in numerical order and the one with the shortest distance from the sun must be for Mercury, etc. The other set of facts had orbital period, how long it takes for the planet to go around the sun, so again, they could put the table of facts in order, shortest period would be the Mercury, etc. I did include Pluto on the organizer because everyone loves Pluto, especially with the latest data from the New Horizon. I had left the number of moons fact empty so they had to look that up on the web or in the Solar System app by Touchpress. There was also a spot on the card for them to write at least one unique feature about the planet, for example, Venus is considered Earth’s evil twin, Saturn’s famous for its rings, Jupiter for its spot. Most kids didn’t get to this in class because we ran out of time. But when taking pictures for this post I noticed my son put Matt Damon on Mars… lol, we’re big fans of The Martian. Physics 009 – Uniform Circular Motion and Black Holes. Yesterday was a very busy day. It started with Physics class, a quick lunch, then 2 hours in the lapidary shop, polishing rocks, swim class and then a special lecture by UC Berkeley Professor Alex Filipennko on black holes. The black hole lecture actually complimented our physics class and big history class quite nicely. Unfortunately the physics lab didn’t go as planned today, at least it took more time than I thought it would so we didn’t quite finish. The students are going to be graphing their data at home this week and we’l analyze the results next week. I started the class with a flying bat toy hanging in my tree in the front yard. It has batteries and if you give it a push it will fly, wings flapping and everything, in a nice little circle. I asked the kids to use the video physics app to record the motion, either from the side, or from directly below the bat and see what they get. The black bat with a complicated tree pattern as the background made automatic tracking freak out so the kids had to mark each point by hand in the video but they got some really nice results. The graphs below were done by recording the motion of the bat from below and marking the origin as the center of the circle. 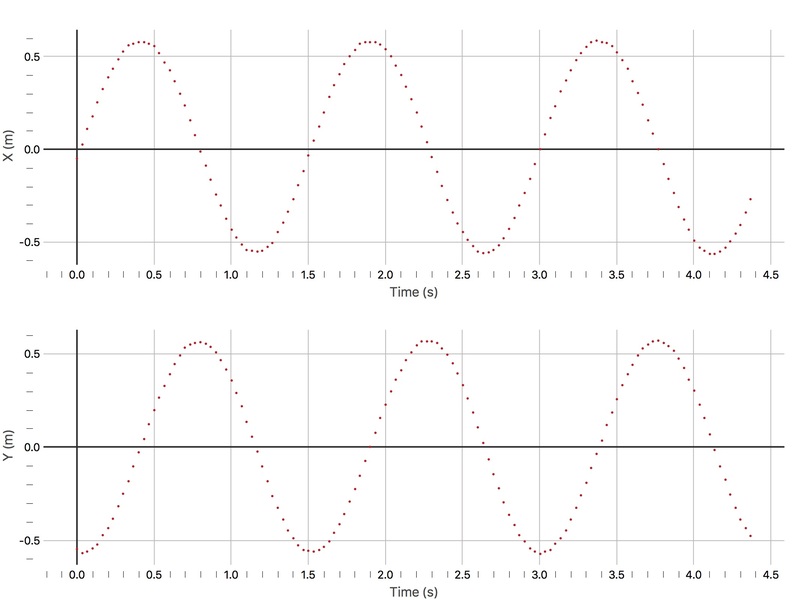 As expected they got beautiful sine and cosine curves for the motion and you can easily read the period of the motion, when it starts to repeat, off the graph as 1.5 seconds. Once they finished looking at their graphs we went inside and talked about circular motion a bit before starting the next lab. I asked the class if the bat circling in the tree was accelerating and they said no because the speed is constant, so I reminded them that acceleration is a vector and has direction and so does velocity. So the speed may be constant, but the direction of the bat is constantly changing so its constantly accelerating towards the center of the circle and we call this centripetal (center seeking) acceleration, which is caused by a centripetal force – the string in this case. To see how the speed of the object depends on the radius of the circle, we did an experiment where we could exert a constant centripetal force by hanging a know mass (100g) on the bottom a string which passes through a tube (empty bic pen) and is then tied to a rubber stopper (the object that is going to be experiencing uniform circular motion). 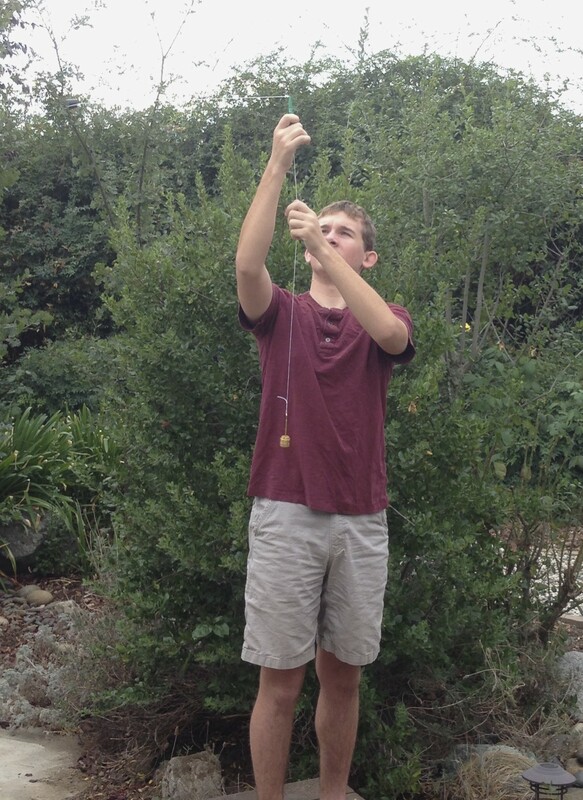 You can see a student swinging the rubber stop in the photo, and the brass hanger with 100g at the end of the string. Once the student has the stopper moving uniformly and quickly enough they can let go of the string and just hold the tube. Then their lab partner measures the time it takes for the stopper to make 10 revolutions. The lab we did was very similar to one I found on the University of Wisconsin website (the link went bad and I can’t find the lab there anymore so I removed it). The students marked the radius they wanted by placing a piece of tape on the string below the tube. This way they could spin the stopper until they got the tape in the right place and know they had a certain radius. They were to do this for 4 or 5 different lengths and then make a graph of speed squared versus the radius and find that its a straight line. I think one of the pen tubes we used was causing too much friction, at one point the string broke and sent the rubber stopper flying! Luckily we were doing this experiment outside and no one got hit. I’l have to wait and see how their data looks but I’m thinking we may redo this lab with better tubes and fishing line instead of string. It would also be nice to measure the speed of the motion as a function of the centripetal force by changing the mass hanging off the bottom of the string. 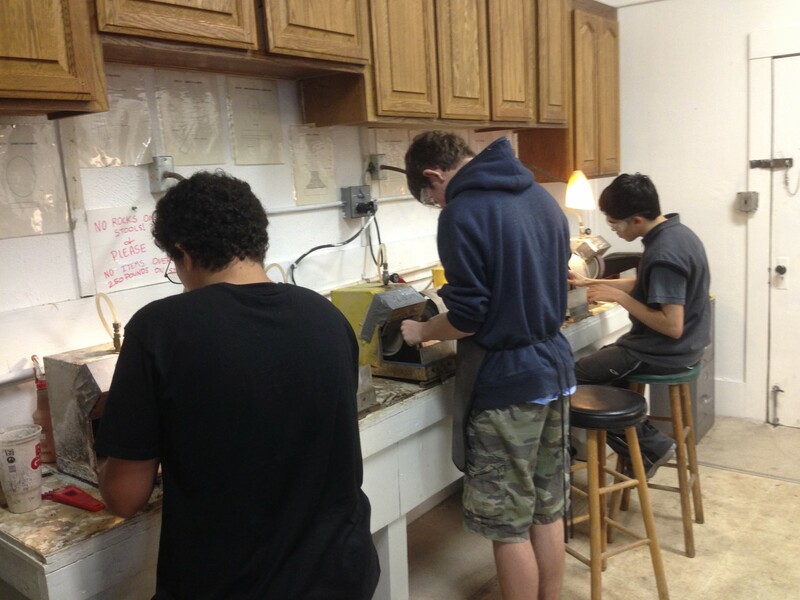 After lunch 5 of the kids went with me to the local lapidary shop to grind and polish rocks. This is a hobby my son and I got into through 4-H. We joined the local rock club so we could use the shop more often and this summer I became a foreman so we could open the shop during the afternoon for homeschool teens. Its a great hobby for teens and it involves quite a bit of patience and skill, not to mention they get use to cutting and grinding wheels. 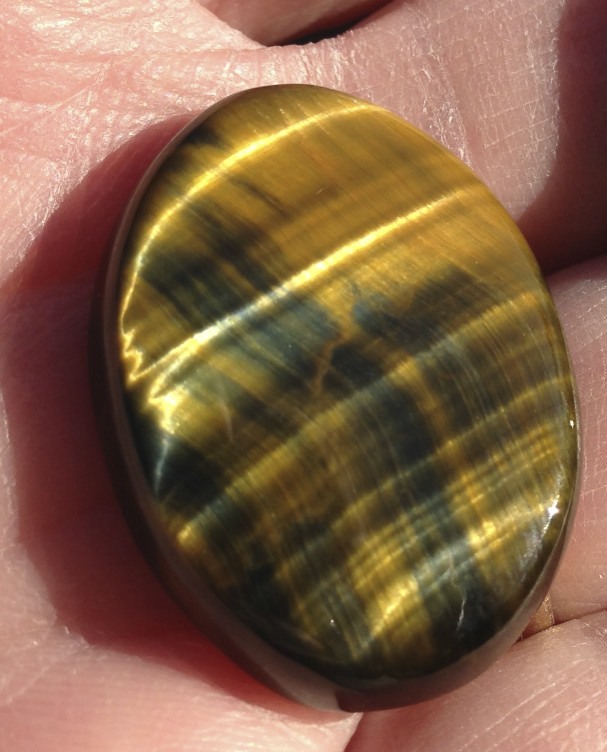 Here’s a tiger eye cabochon that my son made last year. We’ve learned how to wire wrap and actually make most of our christmas gifts now. So if your teen is looking for a cool hobby you might contact your local rock club and see if they have a shop or offer classes. The last event yesterday was a lecture on black holes at the local theater. I was very impressed with the talk by with Alex Filippenko, he’s a great speaker and when it came time for Q&A, he made a special effort to take the kids’ questions first. In his talk, he explained how we know, or at least are confident, that black holes exist. Since we can’t see them directly, we have to look for stars that seem to be orbiting a large mass that we can’t see – basically you look for circular motion (well elliptical motion) of a star and from measuring the doppler effect (red shift and blue shift when its moving away and toward us) of the spectrum emitted you can determine the period of the motion and the mass that must be causing it. So basically he does what the kids did in class with the bat and the stopper – find the period of the motion and from that determine the force causing the motion. Filippenko has co-written an introductory Astronomy textbook and he’s done a couple of Great Courses, one of which is available through the Great Courses Plus beta which ends unfortunately, this weekend. I’m still debating whether or not we’l subscribe to that service. Its going to work like Netflix, pay a monthly or yearly fee and have access to a huge number of Great Courses. Our biggest problem is finding the time to watch them and of course it depend on the price of the subscription. If you have a kid interested in Astronomy I would definitely give his Great Courses a look for he’s a lively and entertaining professor. While we were on vacation I asked the class to make a timeline of their own life, its one of the Big History Project’s activities (Activity 1.4). So today we talked about the Thresholds of complexity that Big History stresses. The first one being the Big Bang, we don’t really know what the Universe was like before the Big Bang, but its probably a safe assumption that it was more complex afterwards. We can’t really talk about the ingredients or goldilocks conditions for the Big Bang either, so we move on to the 2nd Threshold – the first stars. I asked kids what ingredients were needed to make stars – H, He & gravity, and we talked about the goldilocks conditions needed to form the stars – small variations in density which caused clumping, which then caused more clumping, etc. Then we talked about the 3rd Threshold – Chemistry! the formation of heavier elements when the star started dying. The students then had to come up with a threshold from their timeline/life – what event caused an increase in complexity in their life? move to a new city? stopped going to public school and started homeschooling? new sibling, new pet? Started learning a musical instrument? One student said getting their own iPad so we used that as an example. It definitely increased the complexity of their life: new games to play, more ebooks to read, education apps, can surf the net and learn all kinds of things. What ingredients were necessary to get the iPad? Money! Parents willing to buy it, or let them buy it and an Apple Store where you can purchase it. Goldilocks conditions: have to be well behaved – parents aren’t buying you an iPad if you just broke the kitchen window, maybe its your birthday, or you finally saved enough. 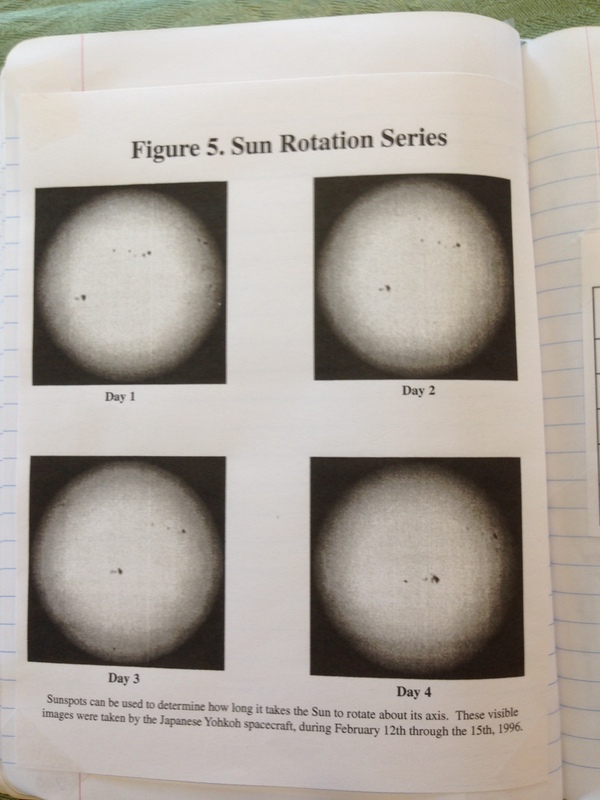 We also did an activity on sunspots. We actually looked at the sun during our last class and saw one small sunspot and talked about how they move a little each day because just like the earth, the sun rotates. So today we looked at 4 pictures of the sun taken on different days and measured the longitude of a clump of sunspots and calculated how much it changed each day. From that they figured that the sun takes about 26 earth days to rotate once. This activity, The Sun’s Period of Rotation (G3) is from the Universe at Your Fingertips DVD and can also be found here. The last activity we did today is also from the Universe at Your Fingertips DVD, How Old Are the Jewels of the Night? Measuring the Ages of Stars (G6), which can also be found here. 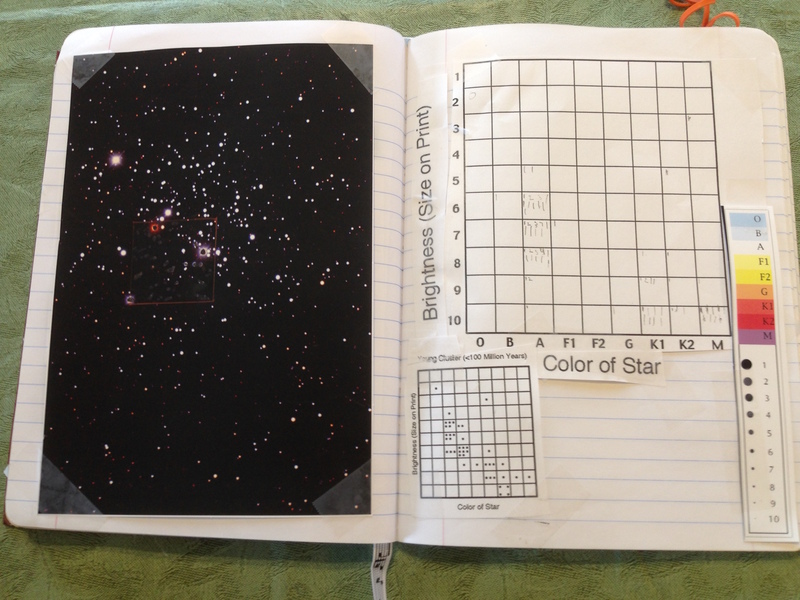 In this activity the kids looked at a color image of a star cluster and used a legend (seen on the far right of the notebook) to determine the size and color of each star in a 4cm x 4cm square. By plotting the size vs color on a graph they were able to determine whether the cluster was young, middle-aged, or old. We also discussed how some of the stars they included in their plot may not actually be part of the cluster since they might be much closer to, or further away from us then the cluster. Almost forgot, at the beginning of class we watched the Brainpop on latitude and longitude since we were going to be using those to record the location of the sunspots. We also watched the videos below about sunspots and the sun on youtube. This lab was all about vectors, and finding their components using trigonometry. I hung a wooden block from a washer and then hung the washer from two different pulleys and put different weights on each pulley so that the set up was NOT symmetric. The students had to determine the weight of the block from the setup without actually weighing the block. They knew there were three forces on the washer, the block pulling down with its weight, and the two forces from the strings pulling up at different angles. Since the washer is NOT accelerating, we know from Newton’s second law, net Force = mass x acceleration, that the net Force on the washer is zero. 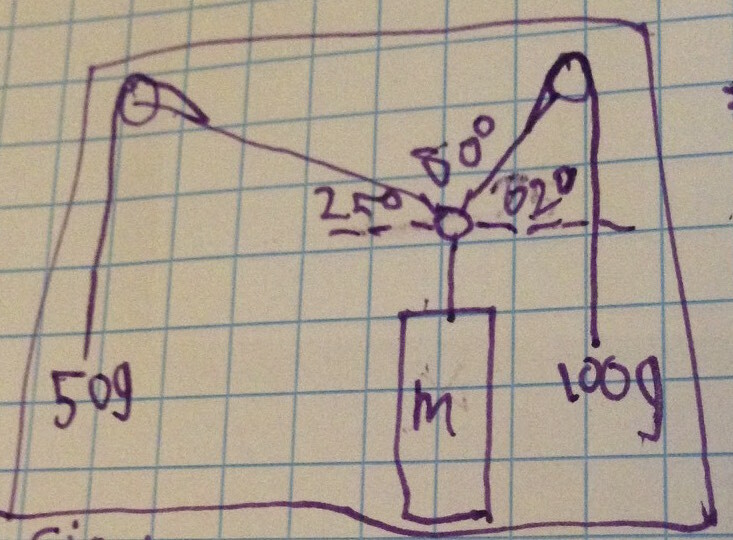 So the forces along the vertical must add up to zero and the forces in the horizontal direction must add up to zero. Students measured the angles of the strings (forces) and wrote down the masses attached to the strings. Then they calculated the horizontal (x) and vertical (y) components of each force using sines and cosines. Since they know the forces exerted by the string, they just have to solve for the weight of the block. We did a number of problems from an old textbook I had, and then I gave them the Trigonometry Pile Up that I found on pinterest. Its like a brain teaser puzzle but you have to use trig to solve it. 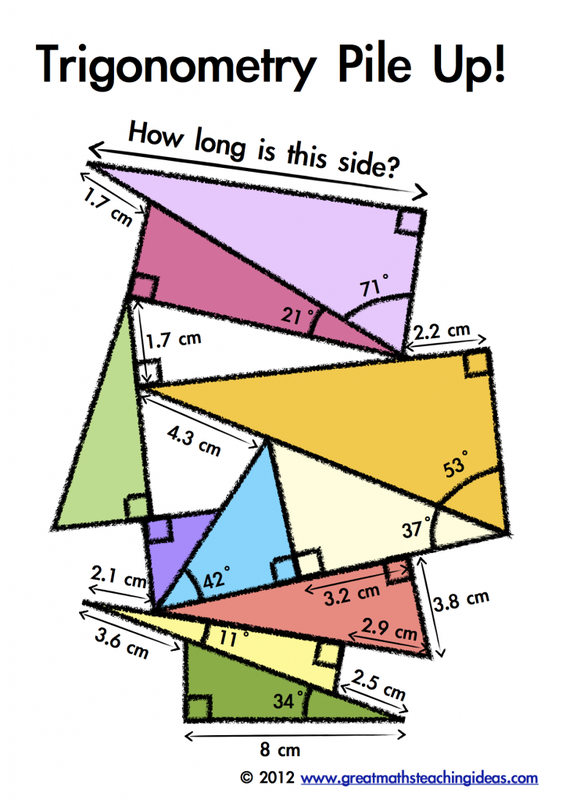 The problem consists of pile of triangles and some information is given for each triangle, but you have to work your way up from the bottom to the find the length of the triangle on top of the pile. Lots of practice using cosines, sines and even pythagorean theorem. Rounding too soon did make some differences in the final answers so make sure they keep a few extra digits til they get to the top. This exercise gave them a lot of practice with the trig functions so hopefully they’l know what to do next time they need one. 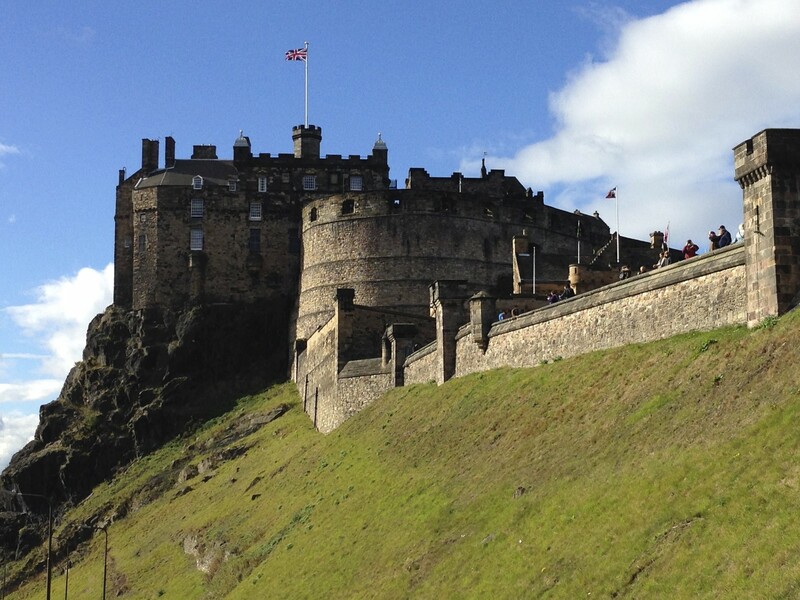 I haven’t posted in a while because we were on a field trip….to Scotland! One of the biggest perks of homeschooling is being able to travel any time of the year, and for us that usually means fall. Its a lot easier to use frequent flier miles in the fall and there are a lot fewer tourists to compete with. This year we spent almost a week on the island of Orkney off the northern coast of Scotland and then a few days in Edinburgh before heading home. Orkney is a very remote location but the island, well actually it is a group of islands, is covered with sites of historical importance. 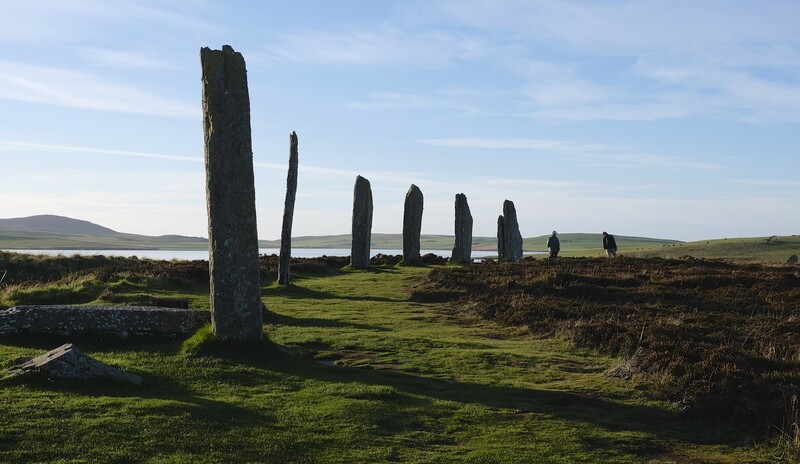 Four of the sites, Skara Brae, the Ring of Brodgar, Maeshowe and the Stones of Stenness are lumped together as a UNESCO World Heritage site called the Heart of Neolithic Orkney. Orkney is also home to the Ness of Brodgar, but the site is only uncovered for a short while in the summer months while they’re excavating. 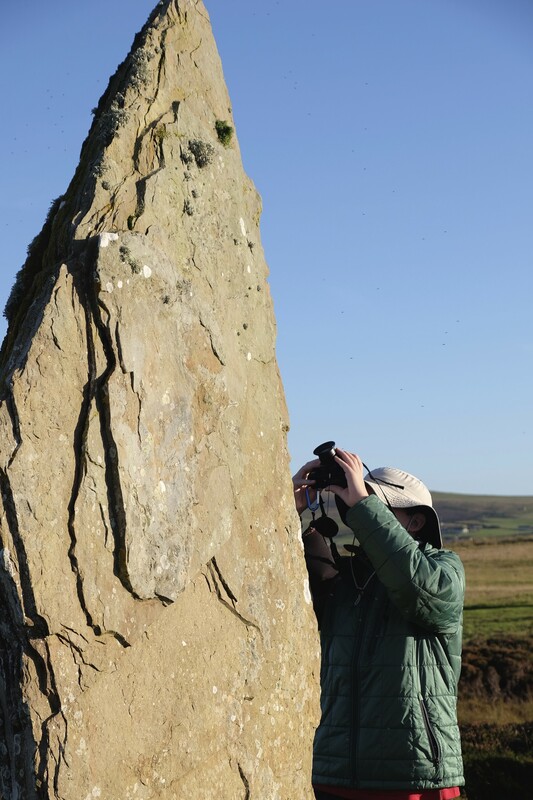 The Ring of Brodgar (photo above and below) is a ring of standing stones that predates Stonehenge and unlike Stonehenge, you can walk right up to the stones. Those are my two boys standing to the right in the picture below. 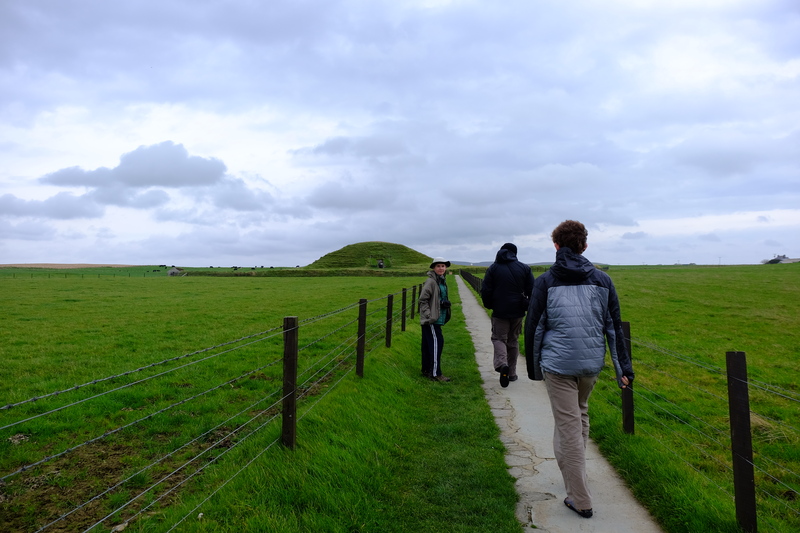 Maeshowe is a chambered cairn/tomb built about 5000 years ago. Unfortunately they don’t allow photography once you are inside, but here’s a picture of our approach. The fun thing about Maeshowe is that Vikings broke into it during the 12th century to wait out a storm and carved runes, graffiti, into the walls, things like, “Tholfir Kolbeinsson carved these runes high up”. Skara Brae is a prehistoric village built about 5000 years ago (before Stonehenge) that was uncovered during a storm in 1850. What’s remarkable about Skara Brae is that the houses were very complete and give a great view of what life was like 5000 years ago. Furniture and carved objects were found in amazing condition. The shelves in the center of the picture is believed to be a dresser where people stored items and the box on the left was for sleeping. There’s a picture book for kids about this site called, “Skara Brae: The Story of a Prehistoric Village”. Walking up to the Dwarfie Stane, Hoy. 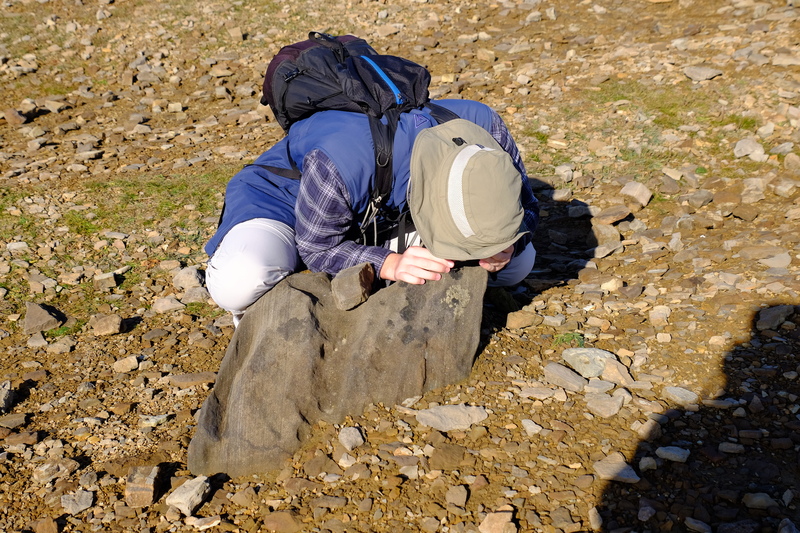 We spent a day on the island of Hoy with our guide, Kinlay Francis of Orkney Uncovered (who I highly recommend), who gave us a tour of the Dwarfie Stane (another neolithic site) and some World War I and II sites. 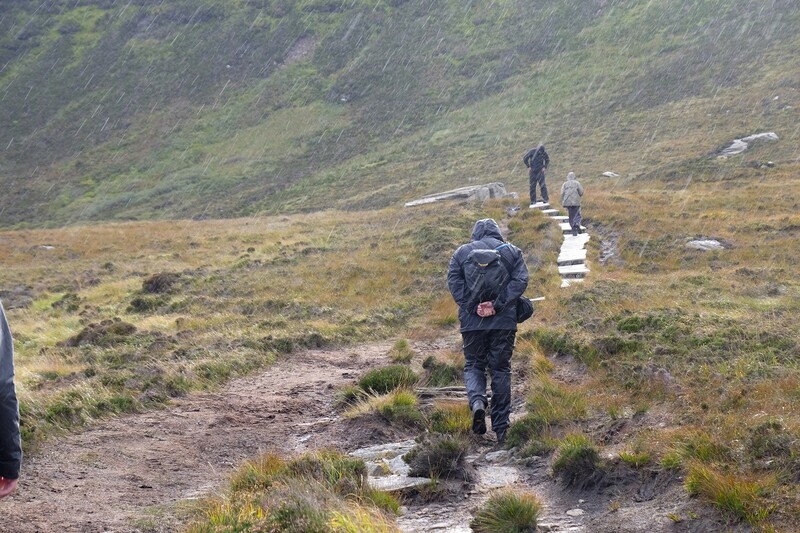 As you can see in the photo, we did experience some great Scottish weather on this trip, but being from drought ridden California we actually enjoyed the rain. My oldest son was really into carnivorous plants when he was younger and I had read that some were native to the island of Hoy, so while walking through the bog in the rain to the Dwarfie Stane we were searching for tiny sundews. I was very surprised that we actually found some and we got to teach our guide some botany. We also stopped by the Brough of Birsay, which you can only access during low tide, Broch of Guerness, the Stromness Museum and the beautiful coast at Yesnaby. 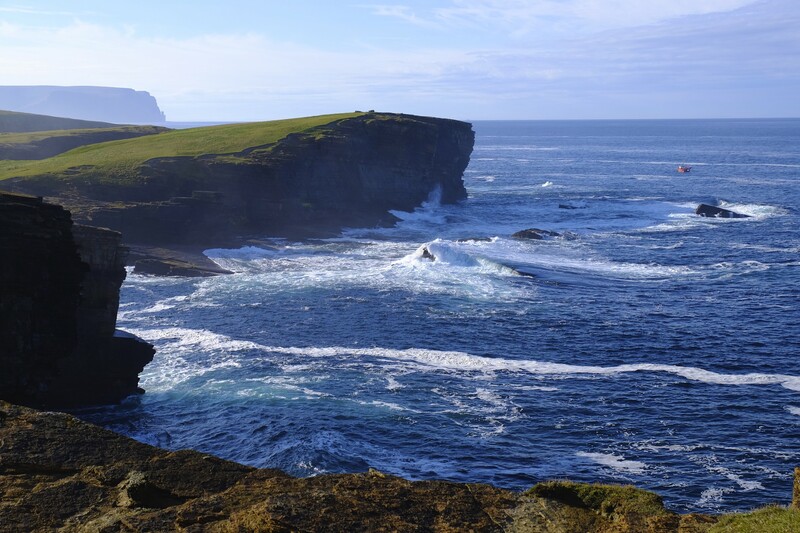 Orkney is small island, but there is plenty to see and do. After 6 days in Orkney we flew down to Edinburgh, spent a few hours in the castle. This was our 3rd trip to the castle so we had already seen it before, but if you go, plan on spending at least one full day if not two exploring the castle. The photo of castle was taken from the window of the Apartment by Castle where we stay. Its physically impossible to stay any closer to the castle and it is a great little apartment. We only had two full days in Edinburgh and spent most of it in museums. The Surgeon’s Hall Museum had just reopened and its a fascinating museum about the history of medicine and anatomy with lots of body parts and tumors in jars. Fortunately for you, no photography is allowed inside that museum. We also spent a few hours at the National Museum of Scotland, which happened to have a special exhibit on Victorian Photography. The National Museum of Scotland has a bit of everything, natural history, geology, cultural history and of course Scottish history, definitely worth a few hours of your time, if not a whole day. The boys noticed on their own that a lot of the items in the museum actually came from sites we had visited in Orkney. 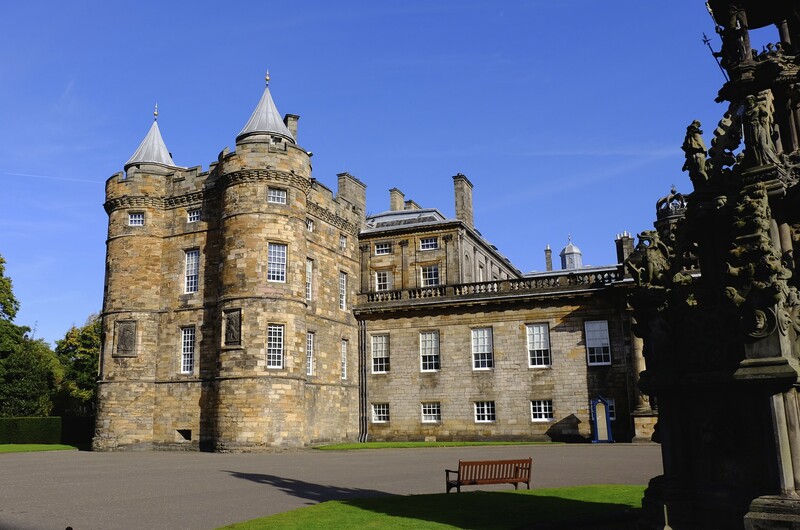 We also stopped in at the Camera Obscura, a museum of optical illusions and walked down the Royal Mile to the Palace at Holyroodhouse. We were only gone 11 days (2 of which were spent on planes…ugh) but we managed to cram in a lot of history. I think we all learn a lot more actually visiting historical places then just reading about them. 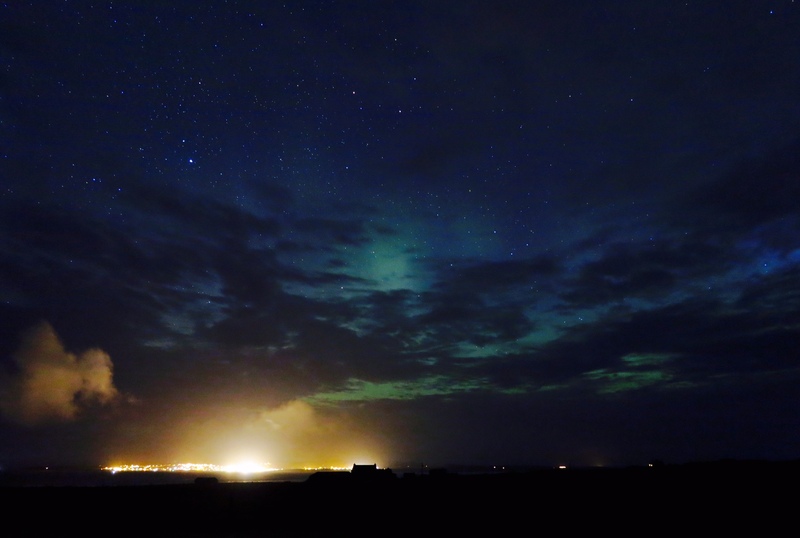 Besides all the museums and historical sites we also managed to see the aurora borealis two nights in a row while on Orkney. A very successful field trip.